On the beach....step off of the deck onto the sand! Wide open views of the beautiful water and beach. Sleep to the sound of the surf! Our home sleeps 10 with 5 bedrooms and 4 baths! Absolutely the perfect property for a vacation, intimate wedding or family gathering on the beach! This classic beach house includes 3 bedrooms and 2 bathrooms. Two attached efficiency apartments open to the rest of the house and sleep 4 extra guests (rate based on 3, 4 or 5 bedrooms--$2,350, $2,850, $3150 + tax, cleaning & refundable security deposit). You will love the open floor plan and very comfortable atmosphere and furnishings. Watch awesome sunsets from two extra large decks, enjoy the beautiful beach or just relax in the hammock. Conveniently located to dining, John’s Pass Village for shopping, boat and jet ski rentals, fishing and gambling cruises. Busch Gardens, The Florida Aquarium, museums and much more are a 30-minute ride. Even Disney World is just over an hour away. The Beach Trolley makes regular stops right in front. A better spot you won’t find! Amenities: Grill, cable television, DVD, stereo, phone, WiFi, outside shower, fully equipped kitchen & linens, washer/dryer, central heat & air, and ceiling fans. We personally manage and maintain this 'classic' beach home. We live just around the corner on the intracoastal side of the island. Why walk to the Beach when you can stay on the Beach and enjoy it 24/7???? Directly on the Open Gulf of Mexico. Directly on the Beach....Step off your deck and you are on the sand! Gulf of Mexico in your Backyard!! Famous Beach Resort for over 100 years! Relaxed Beach Town with over a dozen Great Restaurants and Bars, new Supermarket, Drugstore and many Shops. One mile to famous John's Pass with Charter Fishing, Boat Rentals, Jet-Ski Rentals, Parasailing, Fishing, Bait/Tackle, many Seafood Restaurants, and Shops. Gathering, Events, Reunions, Intimate Weddings, Receptions, Parties etc. with more then the stated number of guests on the rental agreement are required to have written approval from the owners before reservation booking. NO Pets......this rule is Strictly Enforced! Cigarette Smoking is allowed OUTSIDE ONLY with PROPER DISPOSAL! Wonderful home and very helpful host. Location is outstanding. Would not hesitate to go back. My only tiny suggestion might be to have a few extra blankets available. There was bit of a cold snap for a couple of days and we were all cold at night. Thankfully it didn't last and we got right back to enjoying the perfect beach location. Thank you so much! 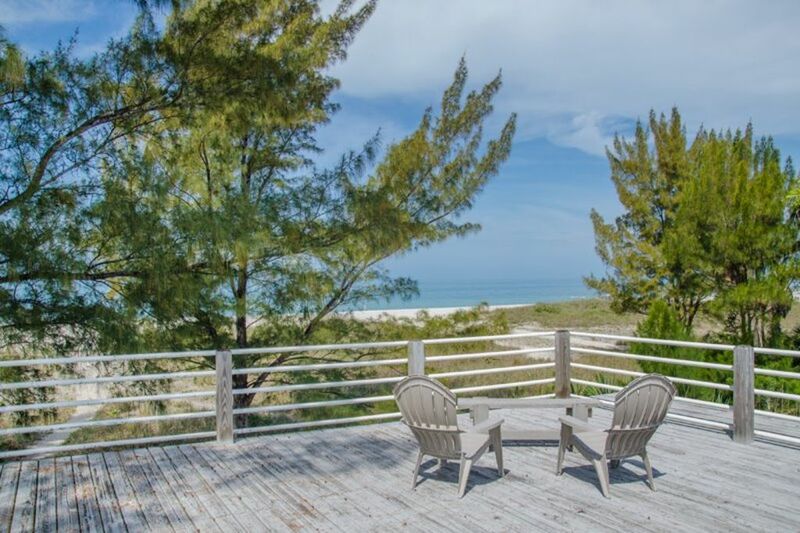 Spacious, meticulously-maintained house steps from the water and white sands! Location is central to everything! The house is very well equipped—kitchen, towels, beach chairs and toys so you’ll never be at a loss for anything. If you are, a grocery store is within easy walking distance. We were concerned about privacy, but this area of the beach does not get much traffic because it’s at the mid point between public access spots. My favorite part of the property was a white sand area just steps from the door and shaded by big pine trees—perfect in the early afternoon when the sun is high and the beach is really hot—you can read or fall asleep in a chaise longue listening to the waves! Great picnic table outside too! The coded door makes things really easy—no hunting for keys! Outside shower great for minimizing bringing the beach into the Bama House. The house is well located so we were able to go on many road trips in different directions—seeing manatees in Crystal River, Universal—they are long road trips (four hours round trip) but very unique and worthwhile—but hanging out and chilling on the beach (great shelling beach) was every bit as wonderful! Susan was a wonderful host—very responsive and helpful—so grateful for our time on Treaure Island! The house is terrific for large groups. It is laid out to accommodate different pairs of vacationers. The kitchen and great room are roomy and comfy and the view from there is fantastic. Would definitely stay again and highly recommend this property ! We really enjoyed staying here....nice and quiet, plenty of room for my family of 10. It was clean and the owner was super nice and very accommodating!!! I would definitely recommend this house on the beach. Everything you need is within walking distance so if you want a nice little getaway this is the place!!! I have just one suggestion and that is the folding beach chairs be replaced. I would definitely give this 5 stars!!! House is comfortable, great outdoor spaces lower and upper decks, and a short walk to a very scarcely populated beach. Close to John’s Pass and a Publix grocery store just down the street. Book it you’ll be glad you did.